Are you thinking about giving your property a paving makeover? 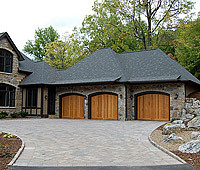 Whether it is a driveway, walkway or new patio AAA Paver Care, Inc will guide you through your paver installation project from start to finish. Our professional team of designers and contractors has many years of experience in the installation of brick and concrete paving stones. We will work with you to create the perfect design for your property, from dramatic to low key, we will work within any budget; no project is too small or large. There are many things to consider when installing pavers. There are various types of paving materials including concrete pavers, brick pavers, natural stone pavers and they can be purchased in a wide range of shapes, colors and sizes. This means that the design opportunities are endless. We can choose the right paving material to blend into the existing materials used on your property. 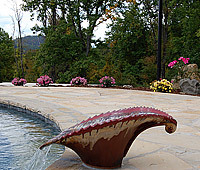 The paver installation cost will vary depending on the type of pavers you choose to use. Natural stone pavers can be a little more expensive than other products, but they are extremely durable and will give your property that timeless ‘old world’ appeal. 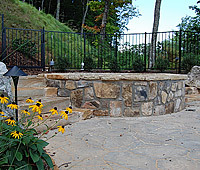 However, concrete pavers can give you the same natural look and durability at a lower cost. They are manufactured products and are widely available and they are easy to install. Once you have selected the paving material, you will then consider the paver pattern for installation. You can choose from a range of paver patterns including herringbone, stretcher bond, basketweave, running bond, fan or circle. We can also add borders and edging to give your paving project that unique feature. Your property will be eye catching and the envy of all the neighbors. Take a look at our portfolio to get some great ideas for your next paver installation project and increase your curb appeal! 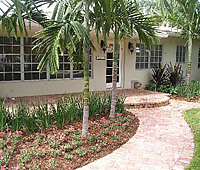 At AAA Pavers, Inc we can also install pavers over existing concrete. So if you have an old concrete driveway with many cracks and stains, we will install the paving stones on top of the concrete. This will transform your driveway into an easy to maintain, durable and stable flooring system. If some of your pavers are damaged or cracked, they can simply be pulled up and replaced. We recommend that your pavers are sealed regularly so that stains and debris cannot penetrate the surface. Leaving your driveway or patio looking as good as new for years to come! Call 561-284-9834 or 561-441-8028.